Fish is one of my favourite food and I am pleased to share the spicy grilled croaker fish recipe with you today. Read till the end of this post as I unfold some important things you need to know on why, what and how to eat fishes such as croaker fish. Purchasing this croaker fish made me nostalgic as I flashed back to what life used to be for me couple of years ago as a growing child... Wonderful memories, which I can never forget when my days were filled with nothing to worry about in life unlike now that I am meant to cater for myself as well as face what life has to offer as the days go-by. Growing up as a child was filled with loads of memories and interesting happenings. My family and I usually travel back to the villa during long vacations to visit my grandparents. Those periods remained highly treasured and very memorable because my grandparents house was full of amusement and adventurous to be in. My kid brother, cousins and I used to visit the river where we spent hours admiring nature and aquatic animals as they enjoy their habitats. There was this old fishing hook, which my grandpa's manservant had then and we often look forward to hitting the river to catch some fishes with the hook. It was a fun-filled moment and we usually look forward to visiting my grandparents so as to enjoy their company as well as have some soothing feel of nature. 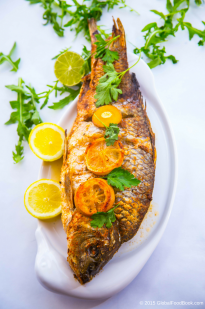 Let me just cut my story short for now and go straight to the main reason of the post, which is to share the grilled croaker fish recipe with my wonderful fans. But before I share the recipe with you, it might interest you to get a better picture of what croaker fish is all about. Oftentimes, most people eat all sorts of fish without bothering to know even the name of the fish, the nutrients that are highly obtainable from the fish or even how best to cook the fish for a more delicious and tantalizing taste. I suppose this post will briefly explain what croaker is all about in case you are oblivious of it. Croaker fish, which is also known as tommy croaker, little bass or Pasadena trout is botanically known as Genyonemus lineatus that thrives mainly in the Eastern Pacific. Croaker fish is characteristically elongated in shape and looks sort of compressed in appearance. The croaker fish looks sort of dazzling brownish to silvery yellowish color in appearance. The health benefits of croaker fish can not be overemphasized as researchers agree that this special Pacific fish is packed with numerous healthy beneficial nutrients and vitamins. Most importantly, croaker fish is among the classes of fish categorized by Environmental Protection Agency (EPA) as being safe for consumption especially by pregnant women or women planning to conceive. This is because the level of mercury concentration in croaker fish is far below the detection level of (LOD)=0.01ppm. Croaker fish is a vital part of a healthy diet as it also contains high quality protein and numerous essential nutrients. Croaker fish is an excellent source of vitamin B12, vitamin A, niacin, folate DFE, vitamin B6, thiamine, riboflavin, Folate and pantothenic acid. 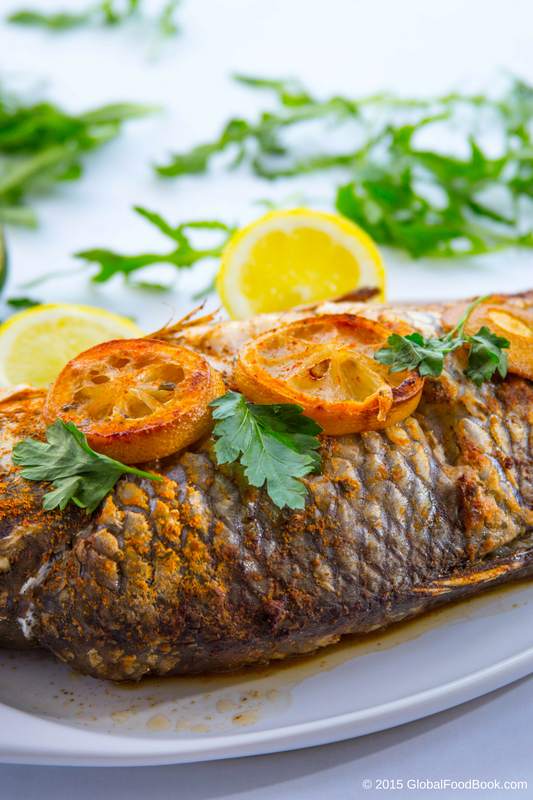 Croaker fish contains low level of saturated fat as well as contains omega-3 fatty acids. It is of great importance to include croaker fish in your diet as well as variety of other healthy fish such as salmon fish. This is because they help to maintain a healthy body especially healthy heart and facilitates kid's development and growth. Although much emphasis are being laid on women and young children to include high quantity of healthy fish in their diets, this call for action is ideally meant for everyone; both men, women and children as we all want to promote healthy generations. Interestingly, preparing this spicy grilled croaker fish isn't a difficult task at all. In fact it is among my favourite list of easiest recipes. The major task is going to a fishmonger, fish market or supermarket to grab the fish and the rest is as good as done. Once you get your fish right in your kitchen, descale it and the remaining task is as good as complete. But hang on, let me reiterate why I prefer going to fish market. At fish market or fishmongers, you stand a higher chances of asking the chaps selling the fish to help you descale and clean the fish properly as you want. This makes it easier for you to just go straight to cooking the fish once you are ready to do so. There are many fishmongers close-by me but among my favourite lists is the Billingsgate Market. Billingsgate market is the UK's biggest inland fish market that is operational at Canary Wharf. At Billingsgate market, you have the options of choosing from uncountable varieties of healthy fishes and at a very good/cheap prices. Most importantly, you stand the chances of having the fishes thoroughly cleaned for you by the sellers. Iyke and I usually go there once in a while and each time we visit there, we always try and buy assorted healthy fishes in large quantities. Not everyone lives or will have access to Billingsgate market but the essence of this write-up is to emphasize on the importance of including more healthy fish or healthy seafood in your diet as a means of maintaining a healthier YOU! Back to the croaker fish recipe, once you've got the fish ready in the kitchen, pour boiling water over the fish and use salt to wash it thoroughly. Washing the fish with hot water helps to get rid of unwanted smell. Afterwards, make three slits on the fish and then rub in all the ingredients you intend to use all over the fish ensuring that the fish is properly coated with the ingredients for a delicious taste. Personally, what I usually do is that once I've rubbed all the ingredients all over the fish, I then drizzle some few drops of olive oil or cooking oil with lemon or lime juice over the fish. Lemon and lime juice adds some sort of sharp distinctive taste to the fish, making the fish so tempting and enticing. Once the fish is ready, just pop it into the oven and allow to cook until done. Another important point to mention here is to cover the fish with bacofoil and make some openings on the foil if the fish is getting burnt. By so doing, the fish will gently cook properly without getting burnt. Slice a few vegetables such as parsley leaves with some lemon and lime, throw them into the grilling pan with a few spices and let all cook away until done. When the croaker fish is done cooking, all you need to do is to add quite a few garnishes and vegetables for freshness and a lil' bit of flavor and then serve up and enjoy. It might also interest you to know that there is also room for creativity in this croaker fish recipe as you can work with what ingredients you've gat and what method that suits you. So, just follow the steps outlined below including whatever edible ingredients you like and at the end, I doubt if you will be disappointed. 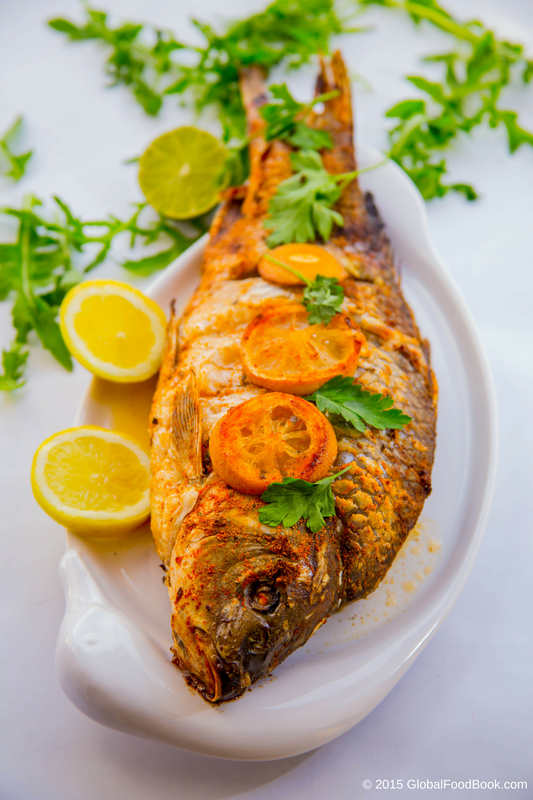 I hope you will joyously enjoy this grilled croaker fish and if you make some for yourself, feel free to share with us your tips in the comment section. 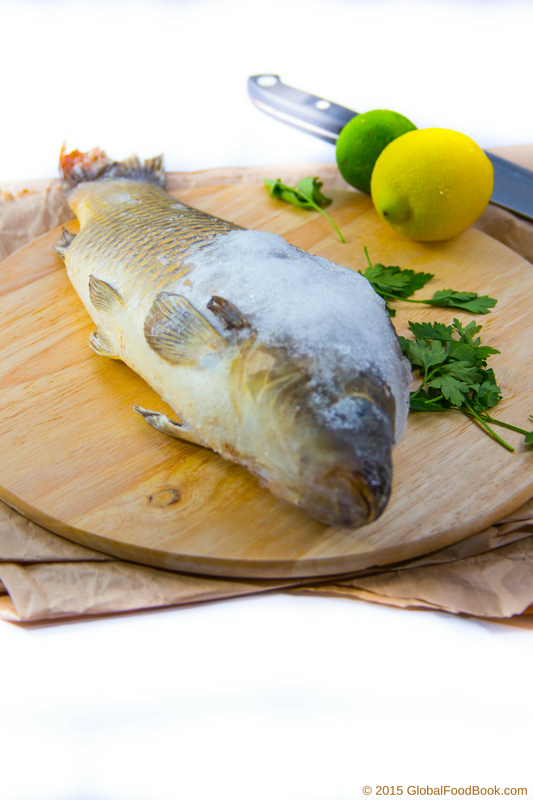 Descale the croaker fish then wash it properly with hot water to get rid of any unwanted smell. 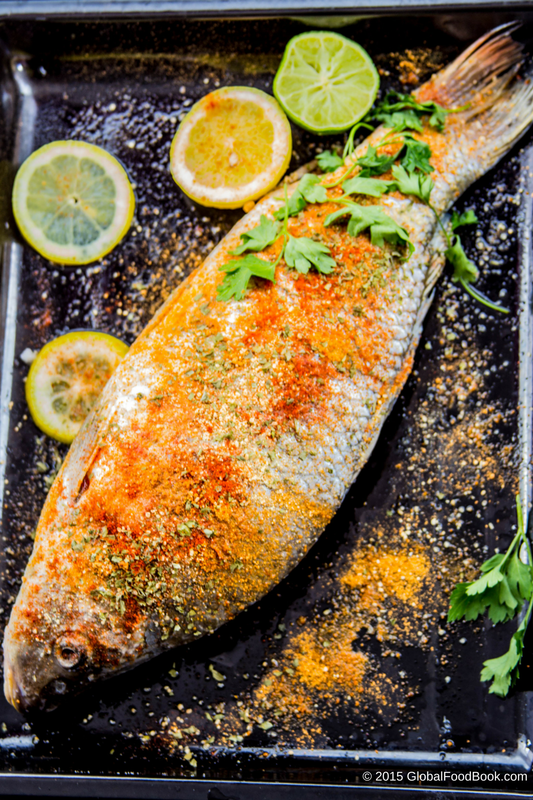 Place the croaker fish in a clean grilling dish, add all the ingredients into the fish. Use hands to rub in the ingredients properly into the fish then drizzle with cooking oil, lemon and lime juice . Make three slits on the both sides of the fish and ensure that the ingredients are rubbed into the slits as well. Cover the fish with a cooking foil, make slits through the foil and place in a pre-heated oven of 150-250oC to grill. Allow the fish to grill until properly cooked. 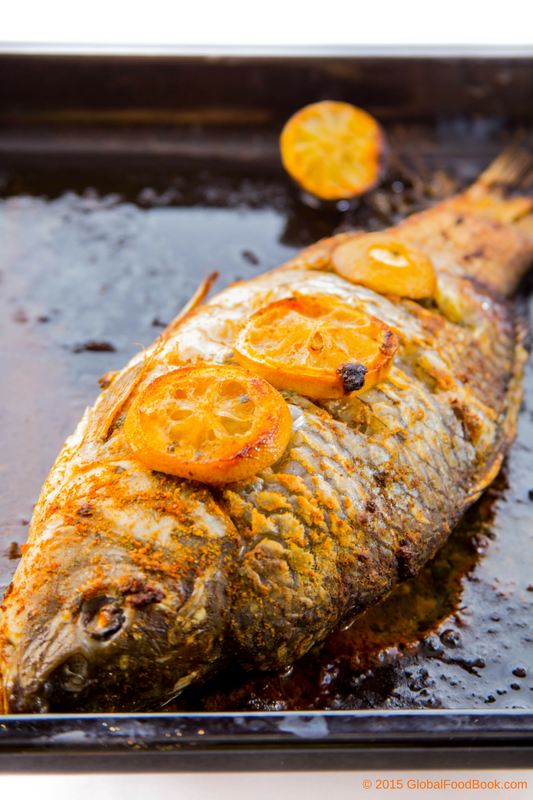 Once the croaker fish is cooked, bring out from the oven and serve immediately warm.